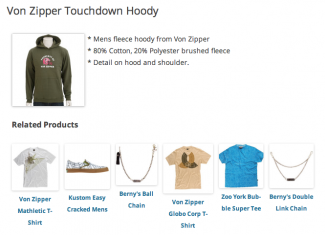 Related Products for WP e-Commerce uses information available within the Single Product template to display related Products that belong to the same Product Category. Looking for support, a copy of the readme, Plugin updates, Ideas or usage instructions? Check out our Documentation for Related Products. Can I display the related products in a selectbox (dropdown) on the product page? And choose the ordering of the products within that dropdown. Hi Dennis, thanks for asking, this Plugin for WP e-Commerce lets a store owner show related Products on the Single Product detail page. Out of the box it will not generate a dropdown list of related Product suggestions but the template file could be overridden to allow this. Yes you can set the related Product suggestions manually but you cannot at this time sort them to your preference; it is sorted by Product ID. Is it possible to show just “in stock” products? But I can’t see ‘Related Products for WP e-Commerce’ through the ‘Plugins’ menu in WordPress.. Apologies if this message if duplicated – my browser timed out when submitting it. 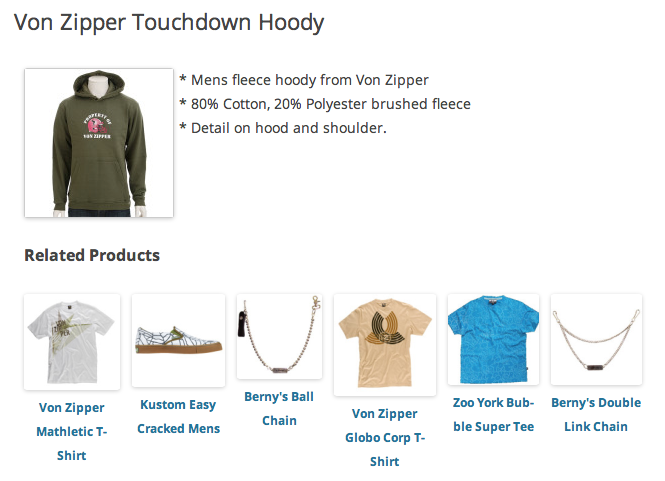 I’m very interested in this product, but I use Pages and a shortcode to display the cart features for WP e-commerce. First of all, is this a plugin that displays a widget? Could I create a sidebar and drop the widget in, allowing to display the related products? How does it know what’s related and what is not? Ignore my message – the FAQ tabs answered all of my questions! Hi AJ, no problem at all. I’ll be adding “Others brought…” integration into this Plugin as it currently uses the currently displayed Product’s Category and Tag data to generate suggestions. Hi Lindsey, currently Related Product uses a fixed thumbnail but what I’ll add a dropdown menu of available options since WP e-Commerce 3.8 gets WordPress to dynamically generate the required thumbnail sizes. Dear Visser. We bought this plugin time ago. Now I want to upgrade since qe upgrade the WP E-comemrce version (to the last one) but I can’t access the download area with the right SessionID … so please, i hae wrote you like 3 times with no answer, please we need the upgrade because the version we got simply is not working… Thanks in advance! I have a new feature request: I would like to show Related Products on the shopping cart page, for all products in that cart. Is that possible? Hi Jackie, great suggestion. There’s a topic in the Ideas section for this feature, Ill see what can do. Awesome, thank you! Please keep me updated (or post link to the topic). Along with the “Add To Wishlist” plugin, this plugin also has significant functionality issues with the latest stable WPEC release. Specifically for this, the related products all link to the same page. As a paid customer, I really hope we can get support for these issues soon. Thanks to jackharrybill’s suggestion for fixing update problems in the “Add To Wishlist” plugins, I’ve found that there is a similar cause for issues in this plugin. This should fix issues with all related products linking to the same page. Change all instances of lowercase “->id” to uppercase “->ID” in the template file of focus. In my case it was the “…/templates/store/wpsc-single_product_related_table-horizontal.php” file. Hi baseofficial, an urgent fix has been issued for both Add to Wishlist and Related Products. Going forward I’m making changes in the way support is maintained and commit to resolving this immediately. I am having some issues with this plugin. First, upon install, I got an error for “undefined call array2obj in line 28 of release_3.8.php. When i got deleted that array2obj line, the plugin started working. I am not sure what I deleted. Second, now I am seeing the related product on a single product page (i.e., http://apartmentprinter.com/products-page/print-products/temlum-business-cards/) but the links for the products don’t go to the related product page, it just links right back to the same product the customer is on. Third, if I set it for more than 2 products to show, the layout goes haywire, primarily I think because the product titles are showing to the right of, rather than below or above the image. How do I change that? Lastly, I would like to show related products of the items in the shopping cart in the checkout page ( http://apartmentprinter.com/products-page/checkout/). Is there anyway, I can get this plugin to recognize the products in the cart on the checkout page, and recommend related products? I appreciate any help you can give me! In fact, I wouldn’t mind subscribing to a premium support if you can help resolve these issues for me. Place the above code at the bottom of your theme’s functions.php file and the error message will disappear. Also if there is an update to the plugin, this will not cause conflicts if the function already exists etc. However, this does not solve the issue of broken links! This should have been tested prior to release and it should simply work out of the box – the fact that it doesn’t work for more than 1 person suggests it has not been thoroughly tested and is extremely worrying to say the least, not to mention disappointing as this is a premium plugin and you have not received a (public) response after more than 2 weeks. There is a drop-down menu to change how the products are displayed, I.E vertical, horizontal etc. on the settings page. You may need to write some CSS to get this to display exactly as you require however. The shopping cart related product AFAIK is not possible with this plugin. I’d imagine this will require custom development or use of a different e-commerce plugin. Hi Gavin, you’re spot on, the last Plugin update was not thoroughly tested and slipped through the net. I’ve been offline this past fortnight due to travel and haven’t been able to assist the community. I’m releasing an urgent Plugin update promptly including the patch above as well as a fix for broken links. I’ll be making an announcement later in the week after reviewing how to better support the community which I have taken for granted. Your solution works perfectly – thank you. I’ve tried manually setting the width and height of the thumbnail and it appears with the right dimensions, but since the plugin calls the image using wp_get_attachment_image, it just shows a cropped version of the non-square thumbnail. Notice It takes ages to load, but when I disable ‘related products’ it loads way faster. Also when I change the css file from the default it seem the site runs quicker also. This has only recently occurred and it was fine before so I’m thinking that this is conflicting with something else, but I have definitely traced that slow load time down to this plugin as the site runs completely differently when its disabled. Do you have any ideas on this? I’ve found that the more product’s I add to my site, the slower the the single product page takes to load…this is only an issue when ‘Related Products’ plugin is activated. I am noticing the same issue you have described. I am fully up to date on this plugin, WordPress, and WP e-Commerce. I recently imported hundreds of products to test out a website I am working on. 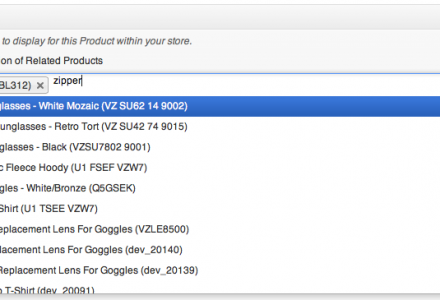 The products also have numerous custom fields via the Custom Fields plugin, which may be contributing as well. The bottom line, though, is that this plugin is single-handedly bringing my entire server down. p.ID != " . wpsc_the_product_id() . " This query runs for hundreds of seconds on my server before finally completing (e.g., 500+ seconds). I am not an SQL expert, and indeed it took me hours to even pinpoint the problem. Can anything be done to make this more scaleable? I’ve had this issue on 2 sites where for any item i have duplicated the product them is missing the the related products section.. is this something you can fix in the plugin? any change this can be looked at? Related Products is a WordPress Plugin to extend the WP e-Commerce Plugin by displaying related Products to site visitors, this provides a cross-selling opportunity to other Products available from your store. It automatically selects related Products based on the Category that the currently displayed Product belongs to, support is also included to manual specify which related Products to display. This has the advantage of displaying? a 'set' of Products (e.g. Silver necklace, silver bracelet, silver watch, etc.). Can I manually define what related Products are displayed against each Product? Yes you can using the simple Related Products widget appearing on the Add/Edit Products page, just select the Products you wish to display and save changes. Read more about this feature on the Usage page for Related Products. Does the current Product being displayed appear in the Related Products? Nope, Related Products filters out the current Product from the list of available Products to display. Can I change the positioning of Related Products on the Product detail page? 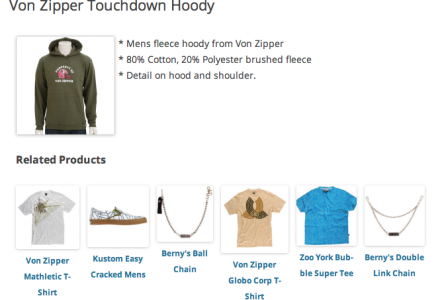 Related Products uses the standard templates 'hooks' that comes with WP e-Commerce to display the Related Products element. You can manage the position by the Position drop-down option within Store > Upgrades > Related Products, that's not all, you can even use a template tag for absolute control. Read the Usage page for more information. Related Products comes with a Quick Start document (readme.txt) to help with installing the Plugin. Additional support can be found from the Contact page or methods below.